1 pound of spicy Italian sausage or mild sausage depending on your preference. 2 cups of a marinara sauce in jar. 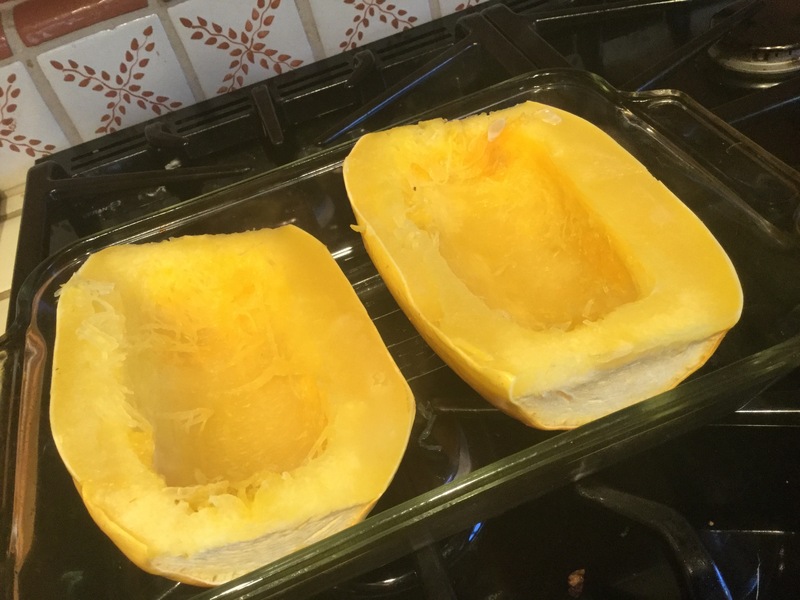 1 spaghetti squash, cut in half and put in a preheated oven at 400° for 40 to 45 minutes upside down in pan with one cup of water covering the bottom. While that is cooking take 1 pound of spicy Italian sausage and sauté in a pan until cooked and then add 2 cups of a bottled marinara sauce. Mix together adding Italian seasoning to taste and put aside. 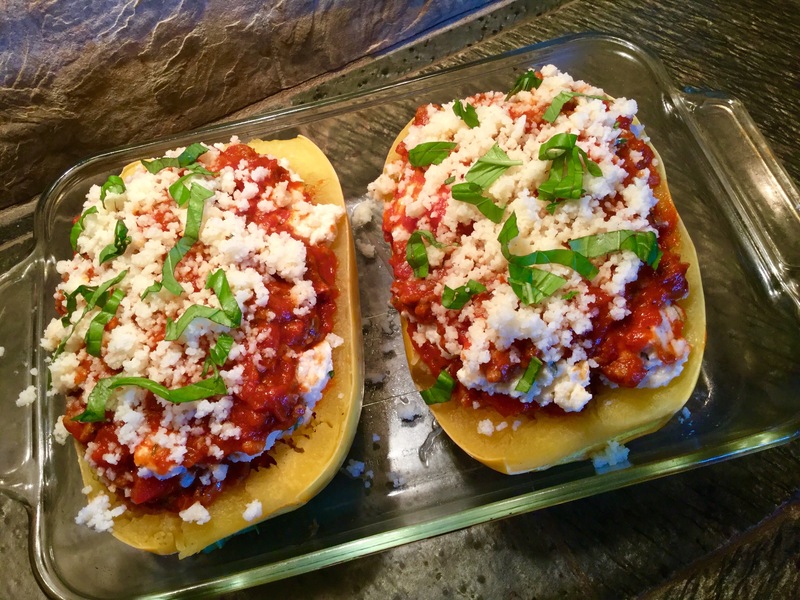 Once this squash has cooled fluff the filling with a fork, and it will look like spaghetti. Next, take your tomato mixture with the sausage and put on top of the fluffed squash. Then, Add the Ricota cheese and mozzarella cheese mixture. Repeat with the tomato sauce and sausage then the Ricotta cheese and mozzarella as a second layer. Top this with one more layer of the tomato sauce and then add mozzarella cheese on top along with fresh basil. Put in the preheated oven for 20 minutes and when it is bubbling turn the oven to the broiler and melt the cheese until it is brown. Make sure you do not burn it. Take it out of the oven let it cool for five minutes cut them in half and enjoy!! Thank you “celiac in the city” website for this delicious recipe!!! 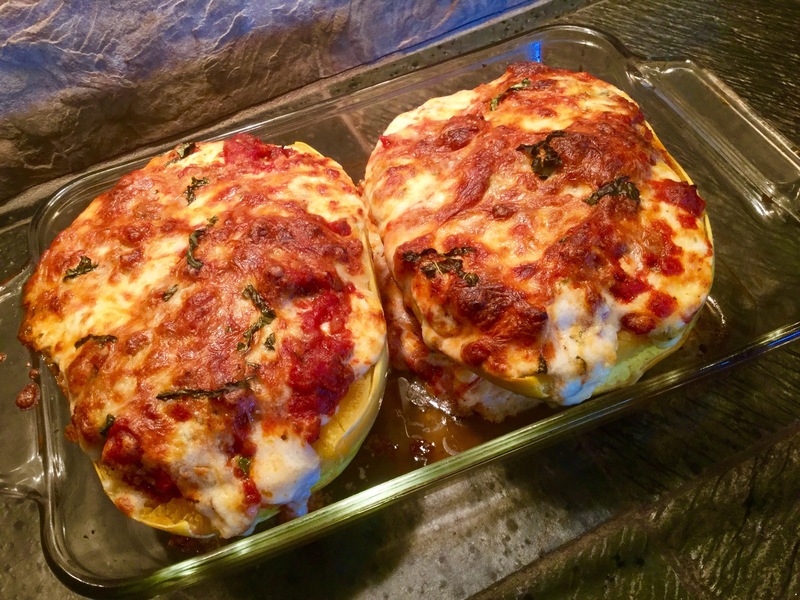 I am so glad you liked it…it is my new favorite….tried another new recipe tonight…corn and herb stuffed zucchini!!! !